You can create filters in Webmail to sort your emails and keep your inbox clean. Filters sort your emails before they are delivered to your inbox, and move them to specific folders, mark them as read or mark them with a star to indicate the email is important. Log in to Webmail and go to Settings. Enter what to look for in an email, for example an email address, a domain or part of a subject. Select what needs to be done with these emails, if should they be marked as read or moved to another folder. Click Add at the top of the screen. Click Save to save your settings and activate the filter. 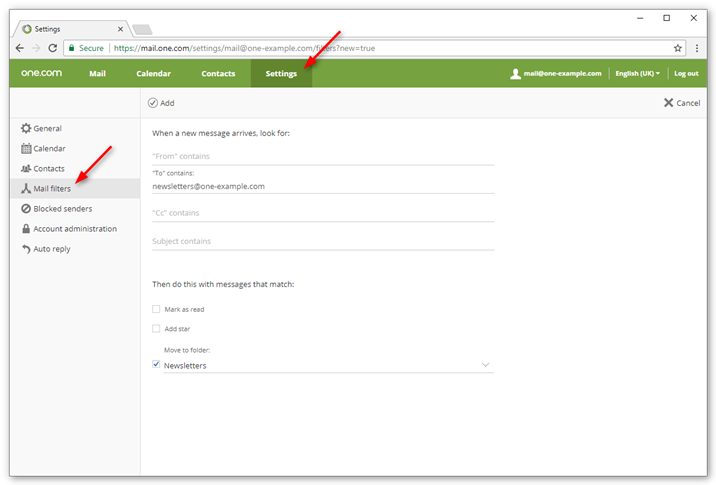 Tip: Instead of a complete email address, you can also add part of the address, for example only the domain. All emails sent from an address on that domain will then be filtered. Your inbox can quickly become swamped with newsletters and updates you have signed up for. An easy way to manage them, is to use an alias when you sign up, like "newsletter@yourdomain.com". You can then create a filter, that moves all emails addressed to this alias, to a separate folder. When you are cc'd in an email, it's usually just "for your information", and not something that requires you to act. If you get a lot of these mails, it's a good idea to filter them to a separate folder. That way you can read them when it suits you. Make sure you never overlook important emails from your boss. Create a filter that adds a star to emails from a certain email address or domain. That way they become more visible in your inbox and you won't miss them. You might get some emails that you never read, but are handy to keep in case you need them later. Create a filter that moves these mails to a separate folder and marks them as read. That way, the emails are there when you need them, but you won't notice them otherwise. How do I stop spam emails?